Some of it’s good. Some of it’s just eh. But I will not be apologizing for throwing another Pumpkin Spice [Whatever] recipe onto the internet because this one is awesome and deserves to be photographed and eaten for lunch and the leftovers taken to Jason’s office where they left the cake plate so clean, it left me wondering just who in my husband’s office stood there and scraped the glaze right off of it. To that guy – or gal, I do not judge – I say thank you. And you’re welcome. So let’s talk about cake. 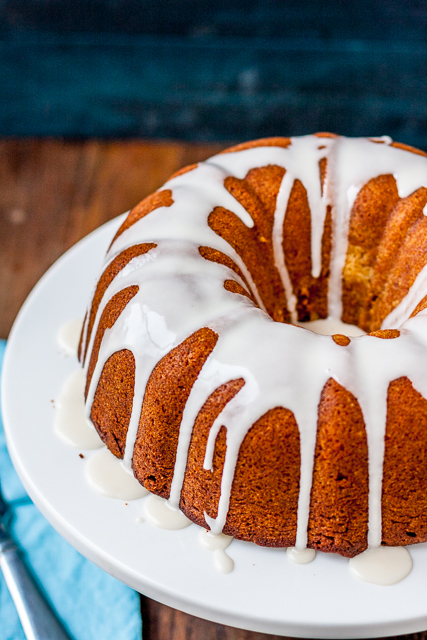 Bundt cakes. 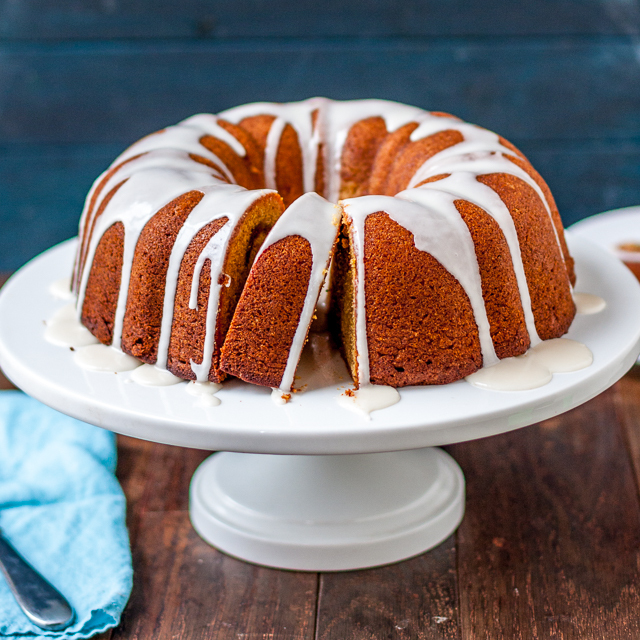 Bundt cakes that are pumpkin buttered. And pumpkin spiced. 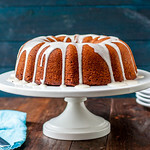 I took a 16 oz jar of Barton Creek Crossing Pumpkin Spread (locals, you can find it at HEB – unlocals, substitute your favorite pumpkin butter or make it yourself), the trusty 1234 cake method, and a bundt pan and made lunch. Half of the pumpkin butter is put into the cake batter while the other half is baked into the middle of the cake. 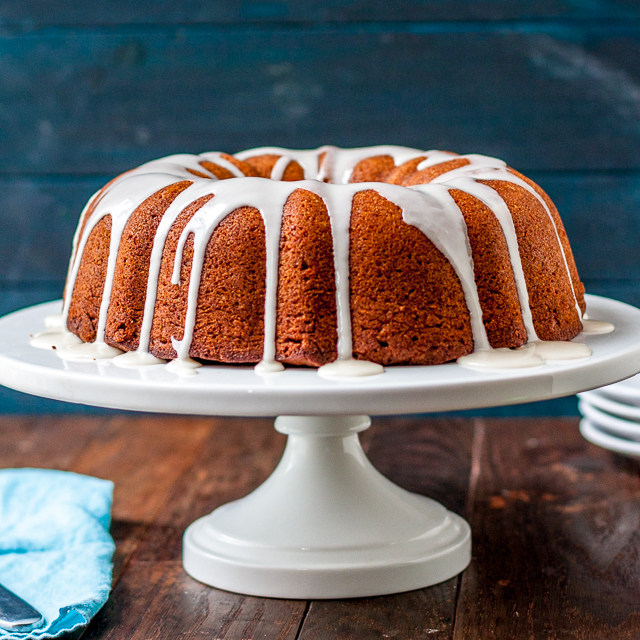 The cake gets a flavorful and aromatic dose of spices from your favorite pumpkin compliments – cinnamon, ginger, nutmeg, allspice, cloves, and black pepper. It’s almost a gingerbread-pumpkin spice hybrid. 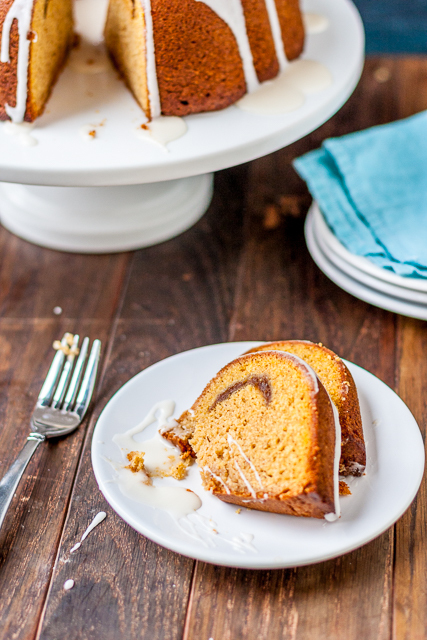 A tender, pumpkin-spiced bundt cake, with a ribbon of pumpkin butter baked into the middle. Cream butter and sugar together for 3-4 minutes, until light and fluffy. Mix in the eggs one at a time, followed by the vanilla, occasionally scraping the sides of the bowl. Alternate adding the dry ingredients in three batches with 1 cup of the pumpkin butter in two batches. Spray a bundt pan with baking spray and spoon half the batter into the pan. Use the large spoon to make a slight well in the batter and add then spoon the ramining pumpkin butter into the well. Cover with the remaining cake batter. Bake for ~45 minutes (a knife inserted into the cake should come out with moist crumbs attached (and maybe a little pumpkin butter) and then let cool for 10 minutes in the pan. Turn out onto a cake plate and cool completely before glazing. To make the glaze, whisk together powdered sugar, maple syrup, maple extract, and vanilla, with 1 Tbsp of water. Add water by the 1 teaspoon until the glaze is smooth but thick. Spoon over the cake, using as much (or as little) as you want. Try not to eat the whole thing in one sitting.